We know — it’s early December. All the drama and intrigue that comes in the heart of the season is several months away. But we’re college ultimate nerds, and as the chill sets in, we reserve the right to cozy up by the fire and take wild guesses at which men will dominate the playing field this season. Let us know if we’re spot on or too deep into the eggnog. College season is nearly here, and we’re too excited to wait. The past two seasons, the buzz on Ing has been electric, and we’ve gotten exciting glimpses of his potential. An incredible sky here, a picture perfect layout block there. But it still felt like Pittsburgh hadn’t totally unleashed him on the world, that the Lamborghini was still in the garage. This season, we should see Ing out on the highway. A key defensive presence since his first day in campus, Ing now also has an offensive skill set that has rounded out, and we saw him look like the complete package on a trip to the final of Mixed Nationals with AMP. It may be uncharitable to say that Johnson had a sophomore slump in 2016, but after blowing past even the most optimistic expectations his freshman year, he took a backseat to Ben Sadok’s incendiary, POTY-winning 2017 season. With another successful club season under his belt with Slow White, Johnson comes into the 2018 season with the experience to match his talent, and he’ll need to slap up some numbers to get UMass back to semis, which bodes well for his chances to keep the award in Amherst for another year. 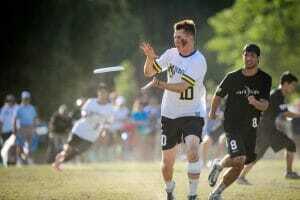 One of the biggest threats to Gooch’s POTY hopes may be his own teammates, as North Carolina returns almost all of their core from last season and add the consensus number one recruit, Liam Searles-Bohs. 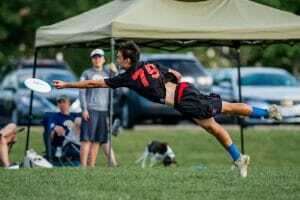 Still, no one on Darkside has the tools to dominate over the course of the season like Gouchoe-Hanas, a dual threat offensive talent that is just as comfortable behind the disc as he is downfield. On top of that he is one of the best defenders in the country, fresh off a starring role on Ring of Fire’s D-line. If he can escape from his own team’s gravity, this could be the year for Gooch. Despite playing in the shadow of Ben Jagt in the past two seasons, Wyatt Mekler has been one of Minnesota’s most effective players. After a great club season with Sub Zero, he will have the task of keeping Grey Duck at the top of the North Central after seeing some big names depart. That’s a good recipe for a POTY candidate, as Mekler will be the driving force behind Minnesota’s offense and if they manage to remain a top five team in 2018 despite their roster turnover, Mekler will likely be the reason why. 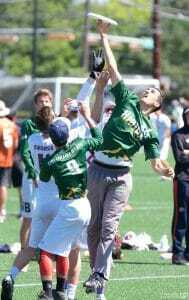 A hipster pick for POTY last season (even though few saw him play), Spicer and his Colorado State team disappointed at Nationals on the big stage after building a lot of street cred during the regular season. But it would be a mistake to write Spicer off as just a big fish in a small pond. 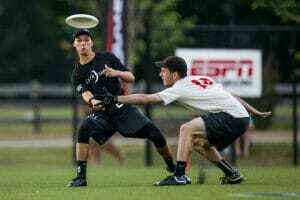 Players and teams making their first Nationals appearance often suffer from the sharp learning curve. Spicer will dominate the South Central this season, and hopefully more people will be able to see him this season with Colorado State playing in some more high profile games. Maybe not a name you would have considered earlier this fall, but after a standout performance at CCC, Jake Steslicki has emerged as a legitimate POTY candidate for Michigan. With the ability to control the flow of the offense and consistently get open, Steslicki also offers excellent defensive skills, including an uncanny ability to bait throwers into delivering him poach blocks. Steslicki led Michigan to a finals berth at CCC and gave UNC a tough game. Don’t be surprised to see a lot of him dominating this season. Rees is the better all around player, Clark makes the flashier plays, and both might not be better than Xander Cuizon-Tice or Will Lohre, so it’s anyone’s guess who takes the mantle as best EGO’s player this season. Olson, the 2017 OPOTY second runner up and one of the steadiest handlers in the nation, is the likeliest candidate from CUT to emerge as a POTY contender, but it could also be Eric Taylor or Sol Yanuck or Henry Fisher or Joe White… good lord, this team is stacked. Entering junior year in a stacked class, Freund may not be the biggest name from that group, but he’s an on-field equal. 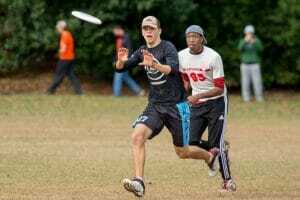 He carried his team to Nationals, a big strong cutter with a handler’s quickness. He stood out enough to be selected as 2nd Team All-America as just a sophomore. Freund is really good. Virginia Tech is not that good. Something’s got to give. If Brown can get back to Nationals for the first time in years, Mac Hecht will be a big reason why. But he can’t do it himself. Hecht is a gutsy shot-taker, with incredible control of the edge on his deep throws and no fear of unleashing them around marks and defenders. He has plenty of flash and enough substance, but he will have to take Brown further to get into the competition. Can Auburn be more than the best team in the Southeast? If so, Marty Newman will be a big reason why, and he could emerge as a POTY threat. The lefty has developed into a more polished offensive entity with a fundamental base that makes him reliable. Newman can even be a shutdown defender when called upon. But he might also have to fight off Eric Sjostrom, so which category to put him in is debatable. Vogt is probably the best cutter in the North Central and an absolute goal machine. If he can add some more dimensions to his game, he could be the best player, period. The past two Nationals he’s gotten hurt the game before quarters and the past two Nationals, Wisconsin has lost in quarters. Insert thinking face emoji here. Got really good, really quickly, and if he continues to improve at that rate and keeps Stanford afloat after losing Elliott Chartock, he could jump into the POTY picture. After earning the Breakout Player of the Year award in 2017, it would be fitting for him to continue the trend. Comments on "The Way Too Early 2018 College Player of the Year Watchlist (Men’s Division)"